Jane Dacre felt that Scotland was a thoroughly respectable place- but that was before she encountered Albert Gates at Dalloch Castle. Though of impeccable family, Albert is a surrealist painter and greatly given to outrageous pranks. 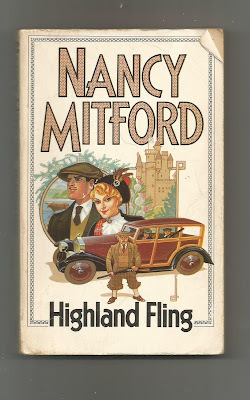 This is Mitford's first novel which was published in 1931. Its very funny in parts with some acute observations in others. She writes a couple of pages regarding why the men who fought in WWI should not be mocked for their post war attitudes, this was after one of the young people got a bit smart trying to impress the party. Poignant is the word to describe what she has written. It is a first book and its disjointed, Jane our hero doesn't even make an appearance until chapter five. However, this was the start of a learning curve which resulted in "Love in a Cold Climate" , one of the funniest books I've ever read. Worth the effort, and again I do love this between the wars period. It is said today many young people are layabout but if you came from money in the times of this book you really had to do nothing for ever.